Sign up for Creative Medical ID's E-mails and receive Coupons for deeper discounts and real savings! Proudly serving you since 2003! 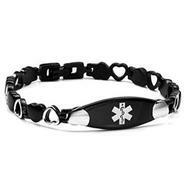 We offer medical alert bracelets to keep you safe in the event of a medical emergency. 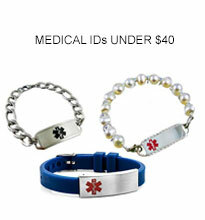 Our medical id bracelets are for Children, Teens, Men and Women's. 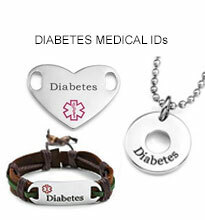 When you purchase a medical id bracelet from Creative Medical ID, we always include the Medical Alert ID Tag or Charm, and engraving of your Life-Saving information is always included, FREE. Anotherwords, you will never pay extra for your medical information to be engraved, nor pay extra when you buy a bracelet with tag, a dog tag, leather bracelet, or any other style that features a medical identification tag in the picture and description. Creative Medical ID Coupon Deals - When we say "Please enter the coupon code for a percentage off our SALE price, you will absolutely get that percentage off.That is, unless it states it is not eligible for further discounts. Just check and see, our prices are extremely competitive. The best news yet - Our beaded and chain medical bracelet styles include a medical id tag, we do not charge extra for an engraved identification tag when you purchase a medical bracelet with ID tag. We also offer a 90-day guarantee against defects in workmanship. 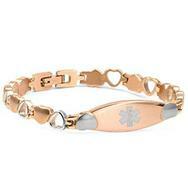 What sets us apart from other medical jewelry companies was our decision to always include Free Medical Engraving. Why leave off critical medical history because the other companies charge by the line? We want you to feel less of a burden on the budget, so the price you see will always include Free personalized medical engraving. We offer custom quarter inch sizing on beaded jewelry, when available. .
We will engrave your life-saving medical iinformation Free of charge on Creative Medical Alert ID tags and charms. 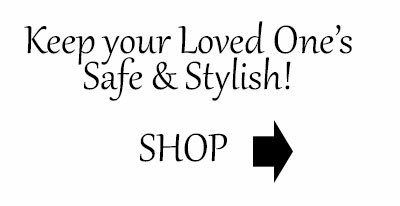 Our bracelets are custom engraved with your personal medical history, so there is no need to look for a special pre-engraved bracelet with your condition. Check out our page on Who should wear Medical Alert Identification? Many of our beautiful medical alert beaded and chain jewelry styles are interchangeable and offer two lobster clasps, which are easily detached from your Creative Medical ID Tag and are interchangeable to change your look for day or night. 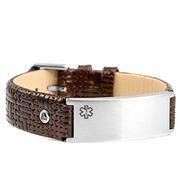 Creative Medical ID offers stainless steel medical bracelets, Medical Alert dog tags, medical id style sport bands, medical alert watches, tattoo art medical id leather bands, cool diabetes bracelets, and the original Medical ID Italian charm links bracelet design. Care to share a photo and story about wearing your new medical id? Click on Tell Your Story or Send us an email to: info@creativemedicalid and we will share your story on the website here, Customer comments . Sign up for our emails and get deeper discounts and notices of new styles! We value our customers and understand your concerns about online privacy and security. Because we know that your privacy is very important, we have established policies to ensure that your personal information is always respected and we do not share your information with any other sites. Your credit card information is safeguarded and secure while shopping on Creative Medical ID site. Creative Medical ID Statement - Whether you have Diabetes, Penicillin or other Allergies, Asthma, Gastric Bypass, Heart Disease, taking Coumadin, have Breast Cancer or other medical conditions, we will engrave your life saving or life threatening medical information (provided by you), free of charge on your medical alert id tag. Your black laser engraving (where available), is always be included at no extra charge. 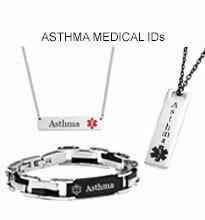 Creative Medical ID jewelry comes with a 90-day guarantee, and all orders arrive at your door with a Free Medical Emergency Wallet Card and complimentary Organza Jewelry pouch. Thanks for shopping with us. Copyright 2018. Creative Medical ID, LLC. All Rights Reserved. downloaded or reused without prior permission.